Main channel waterfront home in awesome gated golf community of River Hills!Water views from almost every room and lots of natural light to greet you on this 1.There are so many areas to enjoy the views - the screened porch with wood ceiling,the huge deck,the lower patio,the great room & master bedroom! Lovely ranch with a basement that can be a teen suite or mother in law suite that has separate entrance! Home is on a cul de sac dead end street so private. The 18th hole of the country club is also part of your views here!New HVAC ,all new french doors along the back of the house & new master bath are all part of the recent renovations and upgrades.River hills offers walking trails,playgrounds,community garden,waterfront beach park,marina and park, country club,golf course & pool AND in the award winning Clover School District.This home is adjacent to the small marina basin for commodore point homeowners but has its own private dock. 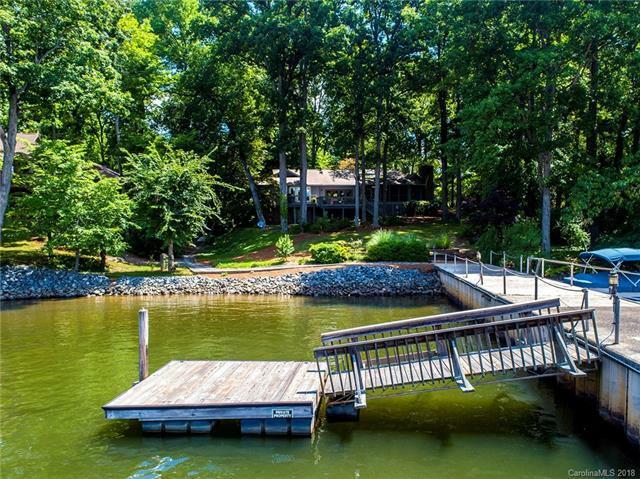 Come enjoy the lake life at a great price!